AFI Festival closed night presented Molly’s Game (replacing All the Money in the World) last night, as well a tribute to Aaron Sorkin. Jessica was looking stunning in a black Elie Saab dress, as you can see in the pictures now added to the gallery. 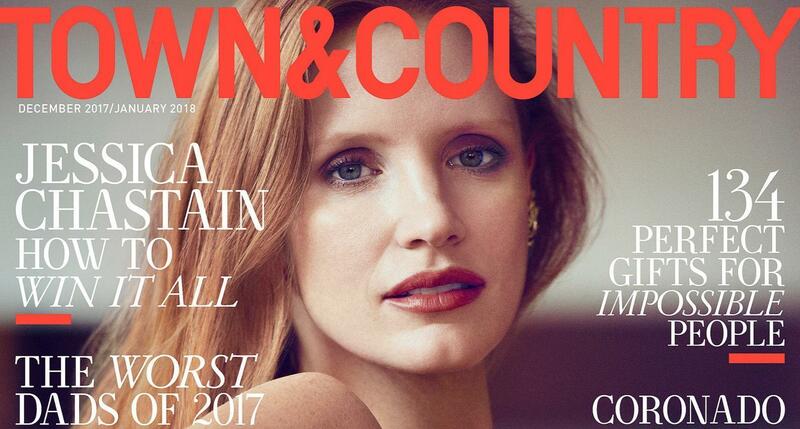 Jessica is promoting Molly’s Game in the new cover of Town & Country magazine, with a beautiful photoshoot by Matthew Brookes and words by Tim Teeman. On the interview, she says she is passing on stereotypically female movie roles in an effort to combat old school Hollywood conventions. In addition to choosing her roles carefully, Chastain says she will no longer accept anything less than equal pay for equal work. Jessica, who has long been an advocate for social change and women’s rights, says she hopes to inspire young girls to defy gender stereotypes as well. The full interview can be read on Town & Country website, and also has been added to our press archive. Scans will be added asap. For now, check the beautiful photos in our gallery. As previously announced, Jessica attended last night the Children’s Monologue at the Carnegie Hall in New York. Oscar winner Danny Boyle assembled an all star A team of actors for “The Children’s Monologues,” a charity event of performances to benefit the UK charity Dramatic Need. The group funds programs in South Africa for impoverished children. Boyle– director of “Slumdog Millionaire,” “Trainspotting,” and “127 Hours”– brought together Susan Sarandon, James McAvoy, Audra McDonald, Jessica Chastain, Anne Hathaway, Jason Alexander, Andrew Garfield, Daveed Diggs, Common, Esperanza Spaulding, Cynthia Erivo, Daniel Kaluuya, Gugu Mbatha Raw, Sebastian Stan, Catherine Zeta-Jones, and on and and on. They read monologues written by South African children and then polished up by dramaturgs like Lynn Nottage, Tom Stoppard, Neil LaBute and others. Also featured was the Via Vyndal Pantsula Dance Crew and the New York City Youth Ensemble. It was a 5 star night that beautifully captured the spirit of South Africa and let some of our newest stars show off their stage ability. No one had more than a few hours of rehearsal. Accordingly Showbiz411, Jessica learned after who she’d replaced. Check in our gallery some pictures of her arrival. As we previously announced, Jessica is taking part of Variety’s Actors on Actors, and she shoot her interview today, alongside Holly Hunter. Our gallery was updated with pictures of Jessica at the 2017 Governors Awards! She wore an Alexander McQueen gown with Louboutin heels and Piaget jewelry at the event hosted by the Academy of Motion Picture Arts and Sciences at The Ray Dolby Ballroom at Hollywood & Highland Center on Saturday (November 11) in Hollywood. Jessica attended in Los Angeles, this Tuesday (November 7) a press conference for Molly’s Game. We finally managed to get some pictures added in our gallery. The Daily Beast has published a new interview with Jessica, made by phone last weekend, to talk about Molly’s Game. But, obviously, talking about the current wave of sexual abuse allegations in Hollywood took a good part of the interview due Jessica’s very outspoken activism on Twitter. About Molly’s Game – and, specifically about Aaron himself – Jessica said she was surprised about his choice on first subject to direct. And, obviously, the interviewer asked her about Brian Singer, producer of her upcoming movie X-Men: Dark Phoenix that she personally called out on her twitter recently. As a woman myself, I also have to say you’re doing amazing, Chastain! You can read the full interview on Daily Beast, and also added in our Press Archive. Molly’s Game opens limited in December 25. The African-based creative arts charity Dramatic Need and Carnegie Hall today announced that Jessica Chastain, Anne Hathaway, Sebastian Stan and Lakeith Stanfield will join the extraordinary line-up of acting talent assembled for The Children’s Monologues, a one-night-only theatrical event, presented in New York for the first time, on Monday, November 13, 2017 at 7:30 p.m. in Stern Auditorium/Perelman Stage. They complete an all-star cast that has been brought together for this benefit performance, also including Jason Alexander, McKinley Belcher III, Common, Daveed Diggs, Andrew Garfield, Daniel Kaluuya, Gugu Mbatha-Raw, James McAvoy, Audra McDonald, Sienna Miller, Javier Muñoz, Trevor Noah, Susan Sarandon, and Catherine Zeta-Jones. The evening’s musical line-up includes Broadway star Cynthia Erivo, cellist Sheku Kanneh-Mason, rapper Little Simz, and vocalist/double bassist Esperanza Spalding. Directed by the Academy Award-winning Danny Boyle, The Children’s Monologues are based on the stories of children growing up in Rammulotsi, a small rural township in the Free State province of South Africa. Invited to describe a day that they will never forget, the work recounts the personal experiences of these young people expressed in their own words-sometimes harrowing, sometimes uplifting, and always moving. Tickets for The Children’s Monologues in New York, starting at $100, are available at the Carnegie Hall Box Office, by calling CarnegieCharge at 212-247-7800, or online at carnegiehall.org. A limited number of discounted tickets will be made available to the general public on the day of the November 13 performance. Jessica Chastain Network – online since 2010 – is your online guide to the talented and beautiful actress know for movies such as The Help, Zero Dark Thirty, The Martian, and more. Here you can find information about the two-time Oscar-nominee and all of her films, an extensive photo gallery housing over 80,000 pictures, a streaming video archive and more. TWLOHA is a non-profit movement dedicated to presenting hope and finding help for people struggling with depression, addiction, self-injury, and suicide). TWLOHA exists to encourage, inform, inspire, and invest directly into treatment and recovery. You can read about Jessica's support here. TIME'S UP NOW is an Anti-Harassment Action Plan formed by 300 prominent actresses and female agents, writers, directors, producers and entertainment executives to fight systemic sexual harassment in Hollywood and in blue-collar workplaces nationwide. The initiative includes a legal defense fund, backed by $13 million in donations, to help less privileged women — like janitors, nurses and workers at farms, factories, restaurants and hotels — protect themselves from sexual misconduct and the fallout from reporting it. You can send them to our e-mail address and we'll reply as soon as we add them to our fansite. Please note that anything that violates Jessica's privacy will not be posted. Show your support for the site by donating any amount of money to help keep the site alive. It will be used to pay domain/hosting/etc. Thank you! All graphics and original content belong to Jessica-Chastain.com. All images are copyright to the their respective owners, the webmasters claim no ownership and recieve no finacial gain for this site. We do not support stalkerazzi of any matter. For more information, please check our disclaimer. Use our contact page or our twitter for contact. We have no official affiliation with Mrs Chastain or her management.